In this video you'll learn how to add a coup stick treatment, to your room to, instantly, improve the, sound of your studio so keep watching if you want to make mixing, easier, but first be sure to download the free acoustic, treatment, cheat sheet there's a link in the bio or on screen now. So. The studio, is pretty much done we're getting there if you've been watching this series so far we spoke about room choice and then in the next video speaker, positioning, so before you even think about acoustic treatment, you need to get those two things down, first but now let's talk about acoustic, treatment, so the first question what. Material, should you use now this can be quite a polarizing, topic because, there's a lot of foam acoustic, treatment out there and from, the photos, that I've seen from my students, and just generally, online it seems like a lot of people opt, to go for foam treatment personally I don't think foam treatment, is the right thing to use of course there are numerous benefits it's, more affordable it's much easier to put up in your studio it's lighter however, there are downsides to take a look at these two graphs on the, left you. Can see foam, acoustic, treatment and on the right you can see an acoustic. Panel which is made of fiberglass, or materials, like rock wall so personally I choose to use acoustic panels that consist of rock walls mostly because of that more level, frequency, response, and also more absorption, in the low frequencies, when it comes to acoustic treatment, it's really the low frequencies, that we're concerned with if you've already got loads of foam don't panic because it's still useful as you can see it does absorb, some of those high frequencies, you just need to start thinking about getting some more acoustic, panels in there that aren't foam, to counteract, that so now that we've covered that let's talk about the purpose of acoustic. Treatment, there are two ways to approach acoustic, treatment you can treat an environment, to make it sound good when you're recording or you could treat an environment, to make it sound good when, you're mixing and quite, often in a home studio we have an overlap of those two things in professional. Studios Live rooms where you record will generally have less treatment they'll be less muffled, normally, it's just a good sounding, room with a bit of treatment whereas the mix room is a different, story altogether we're, trying to create a reflexion, free zone and that's something I'm going to come back to in a minute but to do that we need lots of absorption, around, the mixing area so in this video. Generally, in a home studio environment. If you're working in one room you treat it for mixing, and that will tend to also just slightly, lower, the reverb, and improve, the frequency, response when, you're recording too when you do this right the end result is really, quite, striking and you've probably already hear just in my voice if you seen one of the earlier videos where I was in the same room but with no acoustic treatment already there's much less reverb, which is great for recording so now if I record vocals in here if I record acoustic guitar there's not loads of room resonances, or reverb, ruining, the recording, but then when it comes to mixing we see the real results. We're mixing get, so much easier, because we're in a much flatter. Environment. Where small, EQ tweaks are easier to hear and your mixes are gonna translate, better because your room isn't tricking, you into thinking, that there's, too much or not enough bass for example trust me if you're going to do anything to improve the sound of your recordings, and make mixing. Easier, and more enjoyable into treating your room and just a few hundred dollars is all you need to do this to a professional, standard so in a minute I'm gonna show you how you can build these panels yourself to save money or where to buy them from but before we do that let's figure out what panels we need and where we're gonna place them there are two key things you need to do if you want your room to sound good first you need bass traps secondly. You need to treat the first reflection, point if you do just those two things your room will sound so, much better and, a lot of professional, studios even will only do these, two things or focus, on these two things this whole idea of acoustic, treatment, is honestly. Quite overwhelming, I can remember when I started researching this years ago trying, to treat my first studio and there's just so much information out there that, I left the whole experience feeling more confused than when I started but we really can narrow. It down to those two things being the core element bass traps and first, reflection, points so first of all what a bass traps and why do we need them well in any room you get a buildup of certain frequencies, and these called standing, waves or resonant, frequencies, in layman's terms it's, just an increase, of volume, at certain frequencies, so we might have a sudden peak at 70, Hertz because of the dimensions, of the room where, our speakers, are what speakers were using etc, now generally, these major issues tend, to be in the low end anywhere, from 20, Hertz up to. 607. Hundred Hertz is where we want to focus our energy when it comes to finding standing, waves and treating, them we can make quite a big difference because that's where we tend to get a lot of issues with translation, where if you've got a 70, Hertz peak in your room you're, mixing and it sounds like 70, Hertz are around there is way, too strong so you turn that down in the mix but then you take it to your car and suddenly, the low-end is missing that's an example of what can happen when you don't treat your room but when we use base traps and base traps are just larger. Panels, thicker. Material, that can actually trap some of that low-end, and absorb, it then we create a more accurate listening, environment, now the easiest, way to do this is by using base traps in the corners, of the, room because this is where the base builds up where two boundaries meet so where the two walls meet like, that and then also where those walls meet the ceiling and we have three different, points meeting, you get so much bass build-up there so when we put base traps, thick acoustic, treatment in the corners, of the room we. Can Really effectively, absorb, that, low-end and try to get a flatter response, across the frequency spectrum now I didn't build my bass tracks myself because we're working with the corners of the room generally, you want a kind of triangular. Shape where you use loads of treatment that goes right into the corner, and the, easiest way to do that is by buying panel so I use tri traps from gik, which, are triangular, shaped floor, to ceiling trap. That I can just add to the front corners, of the room and then for the rear corners of the room I couldn't have floor-to-ceiling either side because on one slide there's a door and on the other side there's a bed so instead I got these really cool little corner traps that was super easy to fit I know include links to all of these products in the description below now also have what I've called a daybed in one, of the rear corners of the room and this is just a single bed dressed. As a sofa, so that if people are in the studio working with me they have somewhere to sit but it also has an acoustical, benefit, in that mattresses. Can be really, good at absorbing frequencies, across the, frequency spectrum so they can absorb some low mids as well so I've got quite, a heavy single, mattress on there and then because of the bed frame there's also an air gap underneath, the mattress, so, I'm hoping, this acts as somewhat of a base trap when you combine that mattress, with that air gap and the fact that it's in a corner and it's, just above where the three boundaries meet on the floor corner, of the walls that should absorb quite a few so, just a little trick they're only theory, but we're gonna come back and do some tests later and see if all of this actually worked now I mentioned, air gaps there and the gik panels that I have in the front of the room are just full. Of material, they're a triangle shape they're full of material, going floor to ceiling this is the most effective way to treat the corners but you can also use air gaps and by just adding an air gap behind treatment. Wherever it's just a flat panel or those, corner traps that were in the ceiling, corners, they're, not actually thick all the way back they're only about that thick and then behind them is an air gap because, adding an air gap extends. The frequency, response so, that you can absorb even lower frequencies, than you would normally be able to if the, treatment, the absorptive, material was, just flat on the wall so pretty much all of my panels have air gaps built into them and the ceiling panel is actually a few inches from the ceiling because, that just means they can all absorb low frequencies, so even my panels that I've got on the side wall and outside of the corners are actually going to absorb quite a lot of low in because they're four inches thick and then they've got a two inch air gap so a really easy quick little trick there if you want to improve your panels just add an air gap so far you've addressed these standing, waves in the room and you're trying to get a more even frequency, response across, that low end and lower mid spectrum, but, the next issue that we have is reflections. Off of walls so if you imagine you've sat in the room and you haven't got any treatment, and you're, looking at your monitors you're listening to music and of course a lot of the sound is going straight from the monitors to your ears but, then equally, there's going to be a really loud reflection, from your side walls because, there's not a lot of distance, going on there in most cases so, the sound waves bounce off the side wall and arrive. At Your is quite. Loud but at a slight delay, now this causes, something called cone filtering without going into the science of that it's bad any kind of strong reflection, from your monitor speakers, is going to cause issues with the frequency, response and cause lots of dips across. The, frequency spectra, equally, this can also mess with you when you're trying to add reverb and create space in your mix because you're not only hearing the space within the mix but you're also hearing your room so, you might think oh that's not reverb but maybe you're just hearing the reverb in room so it starts to mess with that as well so there are actually for reflection, points, besides, the side walls we also have the, ceiling, and then we have the floor or the desk sometimes it's the floor sometimes it's the desk it depends how close your monitor speakers are to your desk how big your desk is so, just look at your speakers look around you think okay well I'm gonna get a reflection from the ceiling the side walls and the desk or the floor these are the points that you need to treat to create what's called a reflection free, zone which, is just an area around your, listening. Location, where, you're not getting any strong, reflections, so generally you do this by having some quite big panels, on the side walls a pan, or two floating, above the, listening location, and then we get to the desk or the floor which is the one that's commonly overlooked, but it can be just as problematic as all of the others so if your monitor speakers are quite far in front of you and it's actually the floor where you're gonna get that reflection, and an easy way to test is just use a mirror or just use your phone when it's unlocked because that kind of acts as a mirror and just put, it somewhere and see if you can see your monitor speakers that's how you find the reflection points you can just run this along the wall or get, someone else to do it until you see the speaker and that's how you know where the reflection point is there is actually another way to do it with masks that I'm going to show you in a second but just, imagine if you had your phone or an, imaginary mirror, where. Would You see the speaker's on the floor if they're quite far ahead and then the best thing you can do is just add treatment, on the floor where that first reflection, point is and it might even be that you've just got a really narrow desk, so your monitors. Are that wide your desk is that wide so, there's a little spot on the floor where you can actually see our kay there'll be a reflection coming from that and you just add maybe, some small panels, or, however, you want to do that now more commonly, the problem, is the desk itself especially if you've got quite a large desk so again use that little trick of imaginary, mirror or using your phone or a real mirror and figure. Out where that reflection would be and if it is on the desk you have a few options you can either add treatment, on the desk tilt the desk to about 10 degrees or add, something on top of the desk that acts as a tilt now the easiest way to picture what I mean by this is if, you imagine an old school mixing desk a big mixing desk it will be a slight, slant and you have the monitors behind the desk then, the mixing desk slanting. Down towards, you and then you might have a small, area for your your mouse and your keyboard and. This slant in the desk going towards you will, actually direct, the reflections, much, lower so they go instead, to your ears the reflections, will hit the desk and because they're angry at the desk rather than going about something into your ears they'll bounce off the desk and hit the floor somewhere behind you now if you don't have a huge mixing, desk to do that you can either tilt the desk itself if it's just a normal office desk by putting, some cardboard or, blocks, of wood in the back of the desk this can be kind of annoying though because then you've got the whole desk and you have to tilt it quite a lot around 10 degrees to make sure that they're reflecting behind you again just put a mirror on the desk scan, the whole desk, once you've tilted it and if you can see the, speakers, at any point then you need to tilt them more and then, the other option which I opted, for is, to add something, else to your desk like a monitor, riser or, a big, slab, of word anything, like that that's then tilted at an angle ok we're nearly there you've done well to get this far this isn't the most interesting, topic but it is really, really effective, and once you've treated those two areas, the next thing is to think about the rear wall now this isn't as important. Really. Focus on those two first but if you've done both of those things and you still want to improve the sound or you've got more panels left over or whatever the reason the rear wall is the next place to treat so you can just add some absorption. Here traditionally. In a professional, studio you would have actually diffusion. On the rear wall but that's really expensive to do generally, diffusive, panels, are expensive, to make and manufacture. So instead just go for some absorptive, panels on the rear wall and that would just ensure that there aren't any strong reflections, coming off of that back wall the other benefit, of having more treatment, on the rear wall and just in general in, other places in the room is that again, it's just going to reduce the reverb in the room so when it comes to recording whether, that's vocals, or acoustic guitar you're, going to get a more controlled sound Germany this is gonna sound more professional, and give you more options when it comes to mixing and less, issues with, weird, frequencies. In the room and that kind of stuff now one more place that people often wonder about is the front wall ie the wall behind the, speakers that you're facing that's why it's the front wall and you. Really don't need to worry too much about treatment, there because speakers. Are directional, so all if the top end is going to be coming out of the speaker's towards, your ears where they're pointing, then it's going to bounce off those first reflection, points but you've treated those so, if you imagine where those frequencies are going from the speaker's they go behind you so that's why the rear wall is a good place, treatment but by the time they've bounced off the rear wall and got back to the front wall in front, of you they're gonna be so quiet especially if you have absorption, on that wall behind you but you really don't need any absorption on the front wall behind, those speakers now, having said that it is very useful, to have base traps on the front wall in those corners because low end is omnidirectional. So, that's no nearest direction it's just going to come out of the speaker's in every, direction so it's gonna be quite strong, or, strong gifts in those front corners where the monitors are so that's a really important place to have base traps but you don't really need to treat the area behind the speakers, and that reminds me you should really check out Jason channel behind the speakers if you haven't already with, all of that in mind let's now figure out exactly where, the panels need to go in this room, so here's a rough outline of the room the listening location, is around, there the, speaker's are around here, and, here forming, an equilateral triangle, and the, first thing we want to treat are the, corners with base traps so, in the front corners, I have, got floor-to-ceiling, base, traps so this, whole thing, is filled and it, covers this corner it goes from floor to ceiling and the, same over. Here Now, on the back walls here, we have a door that opens out like, that, so we can't put floor-to-ceiling treatment. Here and here, we also have a bed that's, kind of in this back corner so. We kinda have lots of seal in there so instead, I've got these cool little corner. Traps that, go, flush into the corner where the ceiling meets the two walls so I can still have treatment, on these, ridge, top, corners so not on the floor but on the ceiling and after doing some testing, with my measurement microphone, just doing sign sweeps using room key wizard and putting, the microphone in different places these corners, had some of the the strongest build up in the low end so really. Important to treat these that's why I got those panels they're not thick all the way they actually have an air gap so they're a few inches thick and in an air gap behind but because they're in the corner of three different boundaries where the side walls meet the ceiling that's, going to be quite effective now when I was measuring I also found that this, corner here where the front wall meets the floor was, also getting, a lot of build-up because it's right, behind the speakers that speak as a rear point so I've got some thick 4-inch, panels, that I'm gonna put here behind, the speakers, and they're, gonna be leant against the wall to create an air gap behind them kind of like these so we've got four inch thick foam and then, quite. A big air gap because they're gonna be leaning at a 45-degree angle. And they're quite long they're about 60 centimetres long so, that hopefully will trap a lot of bass as well so that's a lot of our base trapping, done now the panels that I use at the first reflection, point we're all so thick they're four inches thick with rock wall and then again a two inch air gap built into the panels these ones that I built myself so, they're also gonna trap quite a lot of low end as well and that's the benefit of using really thick panels, even in your first reflection, point so the most important, places are here, and here on the sidewalls and I'm going to figure out that exact, distance. In a moment we're starting to have some panels above the listening location, that are going to pretty much span. From the speakers to the listening location, like that and we'll come back to the desk in a second so I've got a few panels left I've got a couple of smaller panels, and one more big panel, that's, 2. Inches thick with a 2 inch air gap so not quite as strong and I'm going to use all of those on this rear wall so we're just going to put one panel, here and then the smaller panels to either side and I, made them this way on purpose because visually, it's quite nice to have a big panel, and then a small panel either side it it creates this nice kind of 3d, effect where this one sticks out more, than these two so I think this one actually might be 4 inches as well with a 2 inch air gap again and these are just two inches of treatment, with a 2 inch air gap sealing brackets have a built-in air gap as well so pretty, much all of the panels have air gaps so like I said that's a really great way to improve. The, effectiveness of, your panels, for free and then I've actually got one more gik panel, left over because I bought these for the ceiling but it came with one spare so what I'm going to do for that is use it as kind, of a floating panel, so if I'm recording vocals something, like that it's going to be on a mic stand and that'll, allow me to move this around the room and if, I'm recording vocals for example I'll probably face, this rear wall because we've got treatment there and it gives me a lot of room and I'll put this behind me so it's in here singing, towards the wall and the microphone, is pointing. That, way and I could do something similar with the acoustic guitar too if I wanted but when I'm not using that for recording, I can move it here into, this corner so, when, the door is open, just tuck it in here somewhere behind the door but then when the door closes I can just move it into this corner and now we effectively, have a base trap in this corner, to which, there was quite a lot of build up here because that door it means I can quite easy just move that here when I'm mixing move it back when I'm not mixing or move it around when I want to record so that's going to be really handy panel, to have as well okay so once you know where the panels are going the next step is to actually make them or buy them so, either option really depends, if you're strapped for time then, you can buy them if you're strapped for money then you can make them I've got a mixture of both so here's, one, that I made a while ago it's just rock wall in the back and then, I built a wooden, frame around it used, corner, brackets just to create the frame got this muslin, cloth material stapled. That In and, they've also just got a bit of string across the back to keep the rock wall in now, just a quick side note when I actually made these I didn't realize what could be kind of dangerous for your health so when you're handling it make sure using gloves and glasses and, a mask to make sure you're not inhaling all of these fibers. I did, look into a bit more in Roxul apparently, is the safest, I'll include. Links to some of this info below but just something to be aware of and what I'm going to do next is get some more material, so I can actually cover, up the whole back of the panel so that there's no risk of these fibers just getting into the room and causing. Issues, so if you do want to make these yourself I'm not going to cover it in detail here, there's plenty of great resources online that will show you how to do this and I'll make sure there's, links below and then the other option is buy them so this panel is from gik acoustics, really. Really good high quality stuff, not too expensive for their standard panels I'd definitely recommend them if you want to just buy panels, instead now in this case I already had a desk that I wanted to use but it's really, really, wired and it's quite deep as well so there would have been some strong, reflections. Coming off of that desk probably, stronger, than the side walls or the ceiling and, it's so easy to overlook this I overlooked. Desk reflections so many times in the past but I wasn't gonna make that mistake again now, I tried, angle in the whole desk so I put some wooden, blocks at the back of the Deaf's so it was angled, towards me by about 10 degrees is, generally. What you need maybe you can get away with a again just use a mirror to check that but 10 degrees works but then it was just way too slanted, uncomfortable, to work on so what I did instead was ordered this why'd desk monitor. Stand off of ebay and it's, meant to have some feet on it but I just wanted the wide wooden. Slab and then, all I've done is put that on the desk add it to makeshift, feet to the back so that it's at an angle and then I've put my keyboard, my interface and there's, room, to add some more stuff in the future and this is a good 10 degree angle where, it's angling. Those reflections, to go behind, me and probably hit the rear wall something like that but I can't see my monitors. Anywhere, now when I put a mirror on the desk or on that slanted, bit I can't see the monitors anywhere so that's perfect I'm not going to get any reflections, off of those fingers, crossed and of course we'll test this when, we do some, room measurements, so how far forward should your side panels, be I found a great formula for calculating, this distance on reel traps com really, great site for anything, about acoustic treatment the company also seems incredible, so I highly, recommend you go check that out of course we'll include a link below so go check out that link and scroll down to the bottom for, that image and that formula, and a bit, more about how to calculate that distance, and then when it comes to the ceiling you can just put the panels halfway, between your listening location, and the. Speaker Location, so, that's all of the treatment in place I'm gonna do a measurement now using room EQ wizard and compare, that to the measurement that I took before I added, any treatment, okay so my treatments, up I, took a measurement with room EQ wizard if you haven't used this software before gik. Acoustics, have a great tutorial on it that I'd recommend you check out and again I'll include a link to that in the description but it's pretty easy to use just need to calibrate it take, a measurement and here, in red we can see a measurement I took before treatment, so you actually saw me take this in the, video on speaker, placement and then in green we have the new measurement and this was made after adding treatment to the room all of that treatment that we just went over is now, up and ready and I, also took a measurement with sonar works reference, which, has applied, a slight EQ curve to the room and this. Is everything this is now my listening, environment, on this, green line so. First, of all you can already see we, have got a bit more control in the low end I matched, these by matching up this peak at 45. Hertz because a lot of the treatment, here I don't think is going to extend the hello so to get the volume is about the same we're matching up there and already we can see a reduction of some of these Peaks so this peak here at, 133. Hertz was, 80, around. 87, dB now, it's around 73. So that's a drop of you know 14, decibels, that's pretty, drastic, not. So great here the lower we get the, less effective the treatment is so the absorption around. 40 s 50 Hertz is pretty much non-existent even, with these big, corner base traps to get absorption, there you need really thick materials, or even a Helmholtz, resonator, which is something. Else that I've never actually seen one in real life but I know some, really good shooters have Helmholtz, resonators, to treat. This stuff but we're, still getting a, drop, here at 80 Hertz which is great so 78, decibels down. To. 74. Ish so not, huge but across the board here we've got more. Control in this. Low-end. Here up to 200 Hertz lower, mid-range also, more under control we have this weird dip here between 500, and 1 kilohertz, and this, is the, trouble when you add lots of treatment, especially if it's broadband treatment you want to control the low end you're gonna inadvertently. Start, to reduce. The volume of a lot of the low mids as well so I need to look into why this has happened it might be that the speakers are moved slightly I did add some plants, to the room there's all kinds of things that could, introduce this, quite wide dip here between 500, and 1k and that's a really important range so I'm gonna look, into that and moving. Up then we have just. Less, volume overall, so what I'm going to do to make this easier to analyze now, is go, to controls, and in murky wizard we can smooth this out so I'm gonna apply psycho. Coup stick smoothing, so straightaway what you can see is we've got way more control in this load and this is really the area that we're focusing on when it comes to treatment, so nowhere near as big Peaks and it's just more consistent, here it's going up, and, down. Down here whereas here it's going up and down but not by as much it's more consistent again, we've got this issue here that I need to look into but. Where it gets really useful, and the tool that you need to focus on really when it comes to room key wizard is the waterfall so this is before, we add a treatment, now let me explain what this shows so like the other graph we've got frequency. Along The bottom so, 20 Hertz on the Left 600. Hertz up here on the right because this is the kind of range that we're focusing on when it comes to treatment and then we've got decibel so this is the same so this curve here is kind of like what we saw but then we have this added element which is the depth element. Here so as well as seeing our k.will this frequency is louder we can also see how long it takes to the K so, this is clearly a standing, wave standing, wave standing, wave where, is louder and it's also taking longer to decay than this, gap here for example between 50, and 70 we've got a much stronger, peak here at around 40, let's compare now to after, treatment, after, sonar, works reference, all of that stuff so straight away more, consistent, we, don't have these, huge Peaks again. Nowhere, near as much control down here around 40, Hertz so if we focus just on this peak here look at the lines how far it extends out it's pretty, similar doesn't really move much however this peak here at around 63. Point a is quieter, and also we can now see the end of the decay times so it's decaying out at around. 288. Milliseconds. Whereas before treatment this was going out much further so the decay time was much slower so that frequency, is really bouncing, around the room a lot more, definitely. Here at 96. Hertz so really, really loud again. Really long to Kate I'm going off the graph where it's here maybe Hertz so, much quieter the. Decay time is much much shorter as well and then across the board from here on out it's pretty consistent yeah we still have these ups and downs with the decay times are, generally shorter whereas here again we've got these peaks, and troughs and, also decay times a much longer. Then the final graph that I want to show you is reverb time so, if we go to, overlays. And reverb. Time before. The, reverb time in general, across the room was kind of in there. 550. To 600. Millisecond, range whereas, now we've got this pretty, far down to in the lower mids we're down to half that. 250. Around there again struggling, to treat this low in here but once we get into these low mids it's much much lower and that shows that we've effectively, created, that reflection. Free zone around the listening environment we've half the reflection, time or more than half in some cases so, now it's going to be easier to mix easier to add reverb to the mix and actually know what we're doing to create depth without being. Tricked by the room so there you go in general effective, still some work to do if I wanted to really go in depth with this I could get a Helmholtz, resonator to try and treat that big peak around, 45, Hertz I need, to figure out why there's this sudden dip between 500, and 1k and that's just gonna involve moving things around the room doing another test. Removing, panels, doing another test playing around with the, treatment on the death because I know that's going to be a problem area even though I've got that slab of wood at an angle maybe that's not effectively, treating, those reflections need to do some research as well and I studied acoustics, at uni but this isn't what I do for a living I'm a mixer, I'm a musician I'm not an acoustician, so I'll go to other people, for help with this as well and then the one last thing that I wanted to show you just because I'm really, impressed with sonar, works reference, which is just room adjustment, software, so you use the calibration mic, it measures your room and then it adjusts with, an EQ curve to, figure out how, to improve your room so we can see here this, was my measurement, before and then it is actually if I turn this on applies, correction, which is the opposite so it measures your room and we can see these same Peaks happening, and then, it applies an EQ curve that does the opposite that's the green line and ultimately. The end goal is that your frequency response is like that now that's, not what happens in real life it's, gonna nudge it in the right direction but you don't get a perfectly, flat response, instead, what you get if we compare those two so if I get rid of before and instead have sine I worked bypass, again, let's also smooth. That Out so, what we have instead is it pulls, it in the right direction and, just, counteract. Some of those peaks and troughs on a wider scale so rather than focusing, in on really. Specific. Frequencies. Like this big, here 80 Hertz, yeah it's reducing that we can see afterwards it's reduced it quite a bit but. It doesn't do it perfectly, and here these dips as well it's, going towards, it but not perfect but when we apply some smoothing, we can see how it just generally levels. It out so we've got less. Low-end, here where it was a bit too much a bit more in this lower mid area it's struggling, around this 500 to one area but I think that needs to be addressed in the room first and then just across the board it's more consistent and, we can see the same with the waterfall actually, so, this is before we've sown and works bypass and we can see these, 2k times here I'm going to go to engaged, it all just kind of tightens, up a bit more consistent, low decay time so that, works really well and I'd recommend once, you've set up your room to use something like Sona works reference, personally I think it's the best option on the market and that is gonna just, take your room to the next level you need to treat at first but then this final step just finishes, it off so there you go acoustic, treatment, how to build a home studio everything, you need to know to create a professional. Listening environment, at home and not, break the bank now there is so, much to remember when it comes to acoustic treatment like I said earlier it can get really confusing there's, a lot of advice out there some of it not, accurate. So I put together a cheat sheet with all of this information I've also got a checklist in there so the cheat sheet part will give you a recap of all of this so if you won't take your notes it's cool there and the checklist, you can use that when you're actually going through and setting up a room to make sure you don't miss anything, out and it takes you through each of those steps one, by one it's completely, free there's a link in the description below or on screen now so go download that free cheat sheet and improve, the sound of your room and if you're new around here don't forget to subscribe and, click the notification. About so that's all from me I'm Rob maizes from musician, on a mission, and remember, create, regardless. Be careful when considering EQ to correct dips in your frequency response. If your listening position happens to be in the null point caused by multiple reflections, adding gain will not help, since you are not only adding gain to the direct sound, but also to its inverted phase, so they basically continue to cancel each other out. The best you can do is add additional treatment, if you can isolate from where the reflections are coming. This point is mentioned in the REW documentation, and I'd be interested to know if Sonarworks admits to it as a limitation. EQ DOES work well however, for peaks in the response! Really helpful, I’m literally in the same boat, new house and the opportunity to make a room a mixing room. I’ve got new Focal front ported speakers and a sub with footswitch bypass (I do electronic music with an ear to club play out so need to be aware of the very low end), Sonarworks 4 and will treat the room with rock/glass mineral wool panels I’m making myself. Plus an old sofa! So thank you, this is all very helpful and especially as I can see someone else in the UK doing it and not someone using stuff only available in foreign lands! I use one room for mixing, and another for recording, because the room for mixing has too much noise, what should i do for treatment ? @20:39 Nice Avantone Cube. How do you like it? 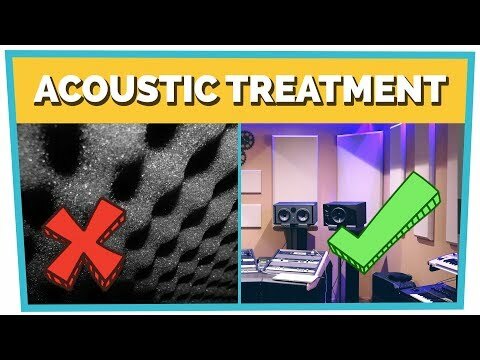 One of the most accurate and well explained video about acoustic treatment! thanks Rob! If I slant my whole desk by 10 degrees, won't that be kinda risky when it comes to the speakers? I don't want my desk to act like I'm on the Titanic. My speakers weigh 16 kg each, and I don't want to get those on top of me. Wouldn't a rug underneath the desk be good enough? I can't have any panels on the floor behind the desk as I need space to move when I'm rewiring things. Brilliant, very very helpful indeed, and personally the timing couldn't be better as I'm setting up my own room which looks a lot like yours! I've had many rooms over the years and have never had one that was perfect. Treating rooms is often not easy. That said you can become familiar with the deficiencies and begin to compensate in your head providing that you use many different references such as your car, living room, multiple studio speakers and, yes, go listen to your mix in a commercial studio for a half hour. I believe Rob mentioned this in another video somewhere. Great Video. Nice one Rob. Question: if one has a big dip at, say, 100hz, can you add a temporary EQ on the master buss that does a narrow boost at the 100hz to counteract the dip? Then prior to bouncing down, disable this correction eq ? Rob, we could be confused, but this seems to be controdictary to a previous video on creating a home studio vocal booth, where upu suggested acoustic blankets and PVC pipe were suggested. If you have the time/money to do proper treatment, this is preferable. Fine video. Your acoustic treatment looks exactly like the one I have, but then again I use GIK Acoustic stuff and got advice from them when buying. Definetely the best acoustic threatment video series on Youtube, very good information and you made it really interesting. Love that you took the time to share your measurements! Thank you very much!! You sir have a cool accent. 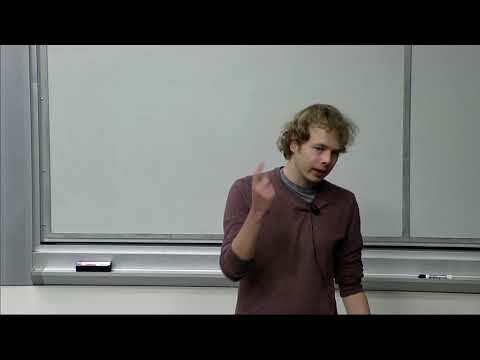 This is the best video on acoustic treatment that I have ever seen. I learned a lot. Thank you. Yep, new camera and still working on that! A great, GREAT video, perhaps the best out there! Thank you so much Rob! Thanks for the feedback Martin! Thanks for the heads up. We investigated your statements and they were verified, going back to 2006 (random search) Materials obtained from synthetic fibres, such as mineral wool, are commonly used for thermal and sound insulation, because of their good performances and low cost. The European building insulation market of a value of approximately 3.3 billion euros has been estimated to : - mineral wool (glass) : 27% - mineral wool (stone): 30% - foam plastics: 40% - other materials: 3%. These materials, though widely used, can be harmful for human health if their fibres are inhaled, since they can lay down in the lung alveoli, and can cause skin irritation. Hence such materials must be adequately overlaid if directly exposed to the air. Moreover they can pulverize and are not resistant to water, oil and chemical agents and this can make their application not suitable for absorbing noise barriers. In recent years, an increasing attention has been turned to natural fibres as alternatives to synthetic ones, in order to combine high acoustic and thermal performances with a low impact on the environment and human health. Natural fibres have very low toxicity and their production processes can contribute to protect the environment. Recycled materials, such as recycled plastic fibres and recycled rubber mats, can even be regarded as a sustainable alternative, as they contribute to lower waste production and use of raw materials. It is however very important to assess the “sustainability” of a natural or recycled material, and to verify the total energy use in its production. Just listened to the previous video and the difference in the reverb between the pre and post treatment is amazing. What do you mean you had to "align" the before/after curves at the 45Hz point? What was wrong with the curves you measured as-is without this "alignment" step? +Musician on a Mission Well, maybe keep this idea in mind for another series :P Knowing what type of room to look for, materials etc... For eg I know there is cabin for that (but it is really pricey though) which can be put on existing room. Acoustic treatment and sound proofing are very different pursuits. Unless a room was purpose built to prevent sound from escaping you'll have a very hard time stopping it. In this video series we're focusing on getting the best acoustics possible from your room. Hope that helps! My bass traps are the thick back seat cushions from a Ford Bronco II. The room has it's voice too. It is possible to mix "bad" rooms. I learn a lot from "bad" rooms. But, it gets to you. Ugh. I'm so tired of bad rooms. At music school, where they don't have any money, I used old newspapers to knock out corners. It worked OK in a very live room. They expect us to play in echo chambers. So, insulting. It was so bad. I quit that school because of the bad rooms. Science labs get all great stuff and humanities get old newspapers. And that was before Donald Trump. What acoustic treatment for Windows? The 500Hz-1000kHz region from my experience is typically mainly affected by the direct sound from the speakers coupling with the immediate reflections from hard surfaces located between the speakers and the audio engineer. The REW measurement result can be sensitive to the height the measurement is taken at, more-so if the desk is built with various angles being present at the reflection point. That being said, I find it unlikely that such audio wavefront coupling would result in a dip of 10+dBSPL.... This is a really interesting problem. It seems that the frequency region above 1kHz is starting to exhibit 'comb filtering'-like effect, probably a result of mis-matched phase between the stereo pair. When was the SW calibration profile made that was used in this video? What is the new angled wedge shelf on the desk? I need one. Windows are actually pretty good at mitigating low frequencies. If you have a back or side window, some mobile or temporary treatment might be best! Hey the REW messureing shows your treatment make the room better but it shows also you cant mixing the bass area. its not enough. Its easy for everyone to reach this result, but a professionell result is muuuch more difficult to become.For helmholz resonator you need an absoluteley master of room treatment and there a not a lot out there. Building a helmolz resonator by yourself its near impossible. I have nearly the same room dimensions and treatments. Just thinking about to set up a 2.1 System with temblor t10. Can you recommend a sub or is it making more "damage"? Btw, thanks for all the vids! Interesting, I made the profile with this exact setup. I'm putting some thicker blinds in so I'll do another measurement after that and start experimenting with the desk! Thanks buddy. I just searched for a "large monitor stand" (as in monitor screen) and found this on eBay! you're a real G for this one, cheers! Haha thanks! Glad we could help. Hello and thanks for the video! Very informative! Could you share your computer info? I am in the market and trying to find the best choice (also a Logic user). Thanks! I assume you are using thick curtains on that window? I get your point about the area behind the speakers being less of an issue, but that much glass, while allowing light in, has got to be an issue, even if your speakers aren't really close to the window. Hello, since in this video you use Absorbers to do the work, I'm wondering if Diffusor suit for home studio treatment? Usually, what's the case to use Diffusor? Thanks. There is a telefon ringing constantly in the back ground. How do you like your HS8's? I've had some experience with them in the past and I just pulled the trigger on some Adam Audio T7Vs. I'm curious about the differences since they're both such well regarded reference monitors. Love them! The most important thing though is to be familiar with your monitors and your room. So learn your new monitors and you'll be in good shape! That's why you have to use foam panels and also bass traps. Wow...now I'm really confused and overwhelmed. this whole series was great! Hey! Thank you for the information, I'm trying to find a quick fix for vocal recording in my home and I'd be grateful if anyone could give me a bit more information on that panel at 19:13 . Which type did you buy? I see the stands on the website but I'm not too sure about the dimensions in the video. any pointers would be greatly appreciated. So it’s important to treat a room depending on where the microphone is for recording AND where the speakers are for mixing and playback. I am currently using headphones to mix music. Should I be using speakers instead, or do I only need to worry about treating the room for microphone placement? Please get rid of the annoying background music.... PLEEEEASE! but you know that is rude right? My favourite room treatment recap thus far; very helpful and systematic, thank you! Very good material... Thanks for the upload. Is speakers better than headphones? This was a great video on acoustic treatment on a budget. Can you also do a video that considers soundproofing materials for musicians?